At the end of every year, Isabel Allende knows what she will write about when she begins her writing season. It was closing in on December 31st when she was out with a friend, walking around in Brooklyn when her friend was telling her about her mother and her Japanese gardener. They had been friends for over 40 years. Isabel responded, “They were lovers.” The friend taken aback, laughed and said, “No, they were just friends!” Isabel said she could not imagine being friends with a man for 40 years and never sleep with him once. 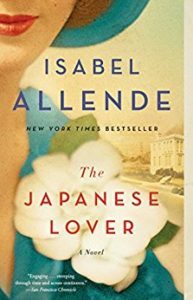 Thus, the inspiration for the tale of “The Japanese Lover.” Allende is a passionate woman and she brings that to her writing. The book is well written and a beautiful story set in the present day and during World War II when the Japanese internment camps took many Japanese families away from the lives they built. The book also dives into a time when races were not mixed. A must read.